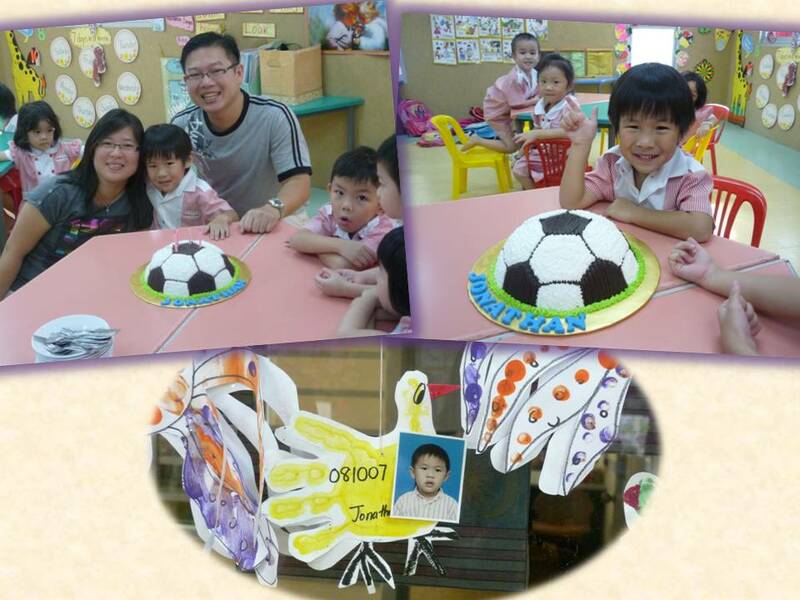 This year, we celebrated Jonathan’s birthday in school. Two days late from his actual birthday as I was away for a training in Singapore. Whenever there is a birthday party in school, he will show me the party pack he got and tell me what kind of cake his friends were having. At this age, he knows how to ask for things. He told me he wanted a football cake and party pack for his friends. He even tell me what he wants in his party pack. So I got Jerrica to make a football cake for him. Why football? I really have not idea. He saw this football cake in Secret Recipe. 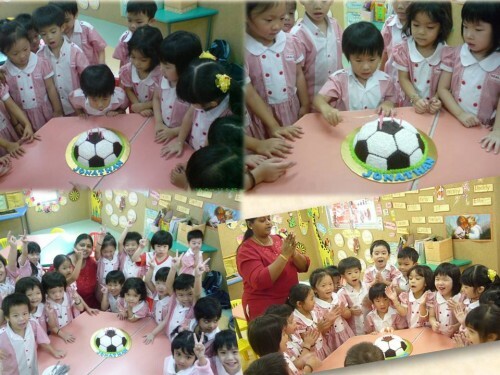 That was where is said he wants a football cake ONLY football. The one in Secret Recipe had a scarf wrapped around the football. So he will always remind me that he wants the football ONLY. Lucky boy is he. Loved by people around him. His cuteness overshadowed his mischievousness. Never had I in my childhood received so many presents. Jonathan boy, no matter how mischievous you are, you are always our little boy…our greatest pride and joy. Daddy and Mommy pray that you will grow up to be a God fearing child. We pray that you continue to stay healthy and safe. This entry was posted on Monday, October 10th, 2011 at 4:10 pm and is filed under Family News, Jonathan, Jonathan's Pre-School. You can follow any responses to this entry through the RSS 2.0 feed. You can leave a response, or trackback from your own site. Happy Birthday to you Jonathan…. Blessed birthday Jonathan! Yeah….got to agree kids these days have nice cakes and plenty of pressies. Happy Birthday to Jonathan. May God Bless him with wisdom and knowledge. 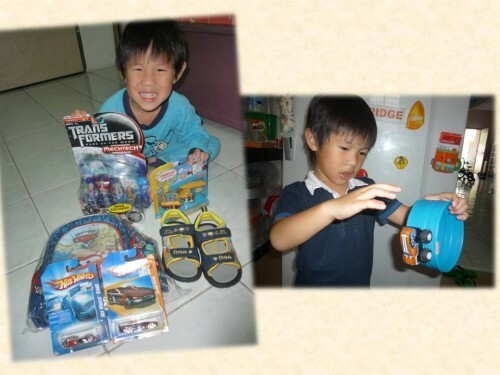 Here’s wishing jonathan boy a very Happy belated 4th Birthday! 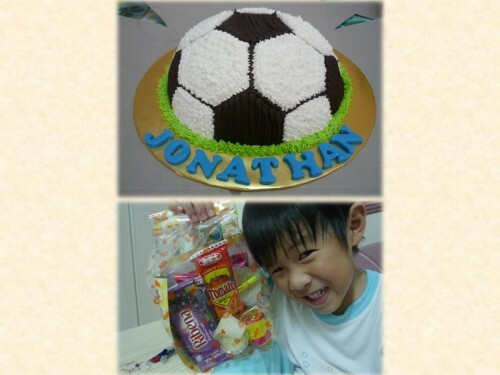 What a lucky boy, to hv such a nice cake, party packs & so many pressies! Happy Belated birthday to your little boy! My daugher, Alex also asking for ..Angry Bird cake, that was 2 weeks ago. Now she is crazy over Smurf. So, we asking her to decide, Angry Bird or Smurf. We will know… soon!